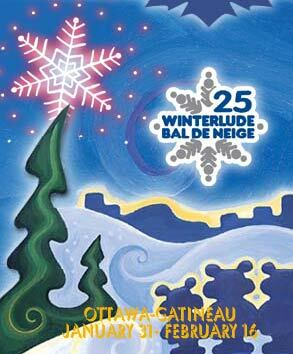 In 2003, Canada's Capital Region celebrates the 25th Winterlude. Winterlude was founded in 1979 by the National Capital Commission (NCC) as a means of celebrating Canada's unique northern climate and culture. Last year, an estimated 656,000 fun-seekers took part in Winterlude activities. More than a third of those visits were by people from outside the Capital Region. Every year, Winterlude attracts thousands of artists, athletes and visitors from across Canada and around the world. The success of Winterlude rests on the support - both financial and in donated services - of the private sector, local collaborators, the media and the community. In a 2000 survey, it was estimated that Winterlude generated over $70 million of spending in the region and throughout the provinces of Ontario and Quebec. Over 800 generous people volunteer for the NCC during Winterlude. The Ice Hog Family, Winterlude's loveable mascots, travel to the Nation's Capital every winter to celebrate Winterlude. The members of the family are Mama and Papa Ice Hog and their children, Noumi and Nouma. The many Winterlude activity venues are accessible every day (except Jacques-Cartier Park in Gatineau (Hull area), which is closed Mondays and Tuesdays); however, special activities take place over all three Winterlude weekends. Most Winterlude activities are free of charge, but registration and admission fees may apply to certain sporting events and shows.